So far this season, the Mariners record stands at 9-15. A lot of people, fans included, thought that the offense was improved from previous years and that it would get the team to respectable levels. Justin Smoak has an improved swing. Mike Morse and Kendrys Morales would provide some much needed pop in the middle of the order. Dustin Ackley and Jesus Montero would start the season with a year of big league time under their belts and be able to take steps forward. So far, through April 25th, the joke's on us. While giving up isn't at the top of the list, it has certainly clawed its way up from the depths and is beginning to whisper in the ears of Mariner fans. Between the interactions on twitter and posts on other blogs, its becoming clear that this team is losing fans even faster than before. In previous years, we could look ahead at what might be with guys like Montero, Seager and Ackley coming up to provide offense where none existed. We were told to wait because it would get better. We just had to wait for the younger guys to develop and get themselves ready to contribute at the big league level. After waiting 5 years, its time to see results and they're not there. Where did it go wrong? Unfortunately, it's been a bunch of small leaks and not one massive hole that is sinking this ship. 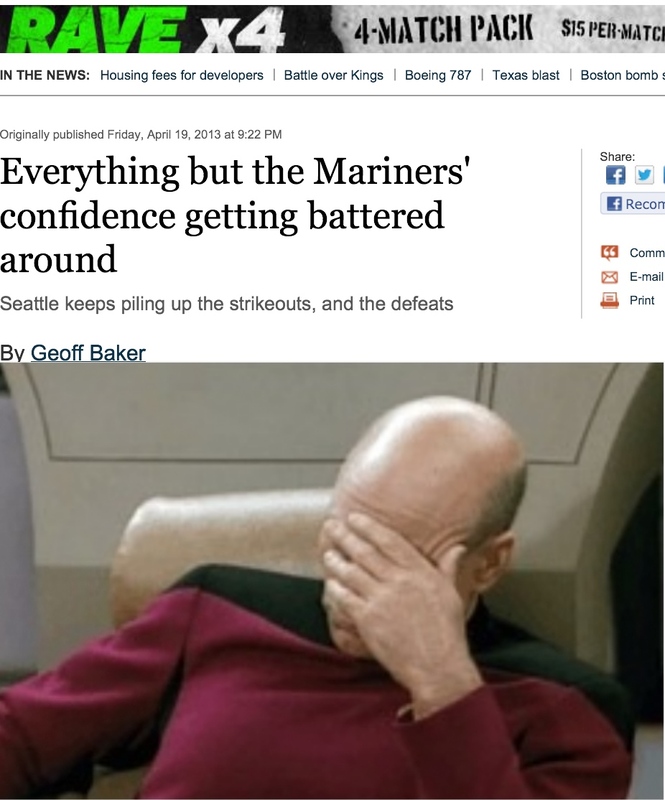 Baseball in Seattle is becoming more and more bleak with each passing game. Sooner or later, something's going to have to give. If you have the stomach for it, read on fellow apathetic fan. As stated before, Smoak's swing was tweaked beginning sometime last year. Dave Cameron wrote a piece this past weekend on Smoak's numbers and how it's becoming readily apparent that Smoak just isn't what anybody expected. Rather than just repeat and/or summarize anything Cameron said, I'll just ask the question, what's to be done about it this season? As I mentioned in this post back in January, the roster construction was looking a little scary and now, it looks downright horrific. If you want to replace Smoak, who do you replace him with? Kendrys Morales who isn't really a first baseman any more? If you do that, you'd have to play somebody at DH, which would be one of the extra outfielders. Michael Saunders will be back soon from his strained shoulder, but even when he comes back, you still have either Jason Bay or Raul Ibanez playing in the outfield or DH, depending on where you put Morse. Franklin Gutierrez's nickname may as well be Mr. Glass with as often as he'll be playing over the course of the year, so you also have that to contend with. The way the outfield was constructed this offseason, the two major assumptions made by the front office was that Smoak was fixed and Guti would stay healthy all season. I think we can all agree that those assumptions were, to put it mildly, stupid. Morse isn't really an outfielder, let alone a right fielder, but he's stuck playing the outfield because Morales is going to DH and management is still in love with Smoak. After Guti went on the DL, the Mariners called up Carlos Peguero for his defense, so we have that going for us. After having watched Peguero a few times, I'm not sure there was a single Mariner fan who didn't snicker at that reasoning. I'm kind of hoping Peguero plays more often because he can't be much worse than anything the Mariners are currently putting on the field. I'm not sure how he's looked at the plate, but if he's learned anything about plate discipline, his call-up may actually be worth something. If he hasn't, we may not get out of this season with whatever sanity we have left. And now, on to the infield. For all intents and purposes, Brendan Ryan has been relegated to a part-time/bench role. I can't really blame Wedge for wanting to make some sort of change to improve this miserable offense, but I don't think Robert Andino is the answer. Andino hasn't looked much better at the plate and the difference between the two players offensively is marginal. While Andino has had success as recently as 2011, he had a Brendan Ryan type season last year with a little more power and a lot less defense. Andino's strength was that he could play anywhere on the infield and that strength is mitigated by putting him in at shortstop. I don't doubt that Ryan could play third base in a pinch, but the left side of the infield would look absolutely horrendous if Andino slides over to third and Ryan comes on at shortstop. As a late game replacement, sure, whatever, the decision has been made. If there's any stretch of time that those two have to play regularly in those positions, the attendance could get even uglier. Ackley looks just as lost as any of the other hitters out there and, sooner or later, he and Montero are going to have to get it going or get sent down to Tacoma. Nick Franklin has started the season on a tear and may be ready to at least get a look with the big club. It certainly couldn't hurt. Franklin is more of a second baseman long term and with Ackley still scuffling, it may be worth it to bring him up and let Ackley work things out away from the empty cavern that is Safeco Field. If Ackley gets sent down, Montero may want to catch a ride with Ackley down to Tacoma. That, however, would be a lot tougher. Zunino started off blazing hot in the first few games, but has cooled off somewhat after minor league pitchers figured out that he hasn't adjusted to higher level breaking balls yet. Yes, he may be ready soon, but he's still a work in progress and wouldn't do much better than Montero offensively at this point. That begs the question, who replaces Montero? With only two catchers currently on the roster, the Mariners would have to get another catcher to split time with Shoppach. Good luck with that. Something I haven't touched on yet is double plays. I don't be double plays the Mariners have turned. I mean how many they've grounded in to. Through April 26th, the Mariners lead the league with 29 GIDP. In second are the Angels with 28. This is something I can't even begin to suggest how to fix, but I wanted to put it out there that no, you're not seeing things. They really do hit into a lot of double plays. A few more stats and rankings related to offense. I'm not entirely sure how or even if things will get turned around. While the offense looked improved, paper doesn't always tell the tale. Some assumptions by management and major regression by some of the younger players has turned this team into a jiggly pile of goo. I'm sure that watching a pile of goo jiggle would be far more entertaining than what we've seen so far from this team. There are still bright spots with Felix Hernandez, Kyle Seager and the possible emergence of Brandon Maurer, but it doesn't make up for the holes in the roster that have shown themselves. Changes to the roster may be coming soon. If not and they ride out the season, there may be changes elsewhere in the organization. Changes are needed and it may happen before the season is over if this continues.